In track there is a very important time during the 4×100 relay. No matter how fast one runner may have gone, everything hinges on the passing of the baton. Proper technique must be practiced and maintained no matter how tired the runner may be. 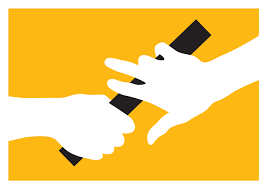 The runner who is receiving the baton cannot go anywhere until it is in his/her hand, and the runner who is passing the baton is not considered successful until the next runner has it in their hand. The success of the handoff equals the success of the race. In the Christian faith there is a handoff that takes place. One generation passes the baton of faith to the next generation. The children in the seats today will be preaching the sermons tomorrow. As a parent there is nothing more satisfying and that brings as much joy, as to see your children genuinely worshipping the Lord. However, as parents there is no one moment in time when the baton is passed; instead it happens a thousand times â€“ one pass, and then another, and then another. One opportunity, that leads to another responsibility, that leads to raised expectations, etc. Slowly, over time, and then years, children grow in their faith and become leaders. Not only is this passing the baton a parentâ€™s responsibility it is also shared by the church as well. No matter your churchâ€™s position on children being present during the service (some leave half way through, some are out the entire time, some stay the whole time, etc.) there will be times when the children will be present for the service. I begin with the assumption that whoever the teacher/preacher may be, that he desires to be understood and impact all in the room. Also, when the service is designed as a whole that the planners do not desire to leave anyone behind. 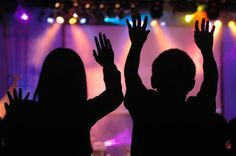 The following are things that a worship leader or worship design team can implement with regard to children being present in a worship service. Sermons that utilize stories â€“ specifically stories about the speakers childhood. This will help the children to see themselves or place themselves into the story. Telling stories â€“ putting principles and precepts into skin and bones, truths and ideas into real or imaginary people and situations â€“ excels as a means of communication. An abstraction may hold some interest, but embody it in a story and it becomes clear, understandable, and compelling. Avoid unnecessary theological terms. If you can explain something or reword it to make it easier to understand â€“ then why wouldnâ€™t you? If there is a term that is important to explain the main teaching point then take the time to define the term and illustrate why it is important. Include children in the service or story in some way. Ask them questions, mention their names in a positive way, etc. One could have them hold up a teaching object (ex. If the main idea was on “division” then they could hold up a splitting wedge. Or if the main idea was â€œserviceâ€ then they could be asked to serve in some way that day during the service.) Of course knowing ahead of time which children are comfortable being in front of others and which ones are not is important. Avoid fact finding questions, instead focus on wording the questions so that they will help them reach a goal or understanding. Remember you are not desiring to raise a bunch of knowledgeable Pharisees, but whole hearted followers of Christ. Make comments that relax the parents. Letâ€™s face it kids are at different stages of maturity (spiritual, mental, and physical). Their ability to sit still will vary greatly, but let me caution you to avoid assuming that because they were moving around that they were not listening. Also, donâ€™t assume that because they were sitting still that they were listening. A comment like â€œChildren are welcome here. We know they may make noises, ask questions, or move around. . . itâ€™s ok.â€ (the same is true for special needs families as well). You donâ€™t have to water down theology or even â€œdumb downâ€ the service just because the kids are there. But you need to pray and spend some time on how to make families feel more welcome and relaxed as they attend services together. Also, a quick note to parents â€“ just because your child may be drawing on the bulletin or crawling around under the chairs, donâ€™t assume that they were not listening. Ask them on the way home what they heard â€“ you will be amazed at what they can retain. As the church and the home work together on making our services more kid/family friendly we will make some great strides to passing off the baton. But donâ€™t forget itâ€™s not a one shot deal, itâ€™s week after week, Sunday after Sunday of partnering together to reach the next generation for Christ. Get ready, set, . . .
 Roy Zuck. Teaching as Jesus Taught (Grand Rapids, Michigan; Baker Publishing), 306. I go into this specific topic in greater depth in other articles. Click here to read further.